It’s fun. It is so much bloody fun, in both meanings of the word “bloody”. Lord Crumb and I wanted to play together right from the beginning, but we discovered that we needed to go through the intro/tutorial separately before we could play co-op. I believe it took us about an hour to finish. From there, it was really easy for one of us to join the other’s game through Steam, and I was happy to see that a character’s progress and inventory are saved independently from the game, which meant that it didn’t really matter who was the host. We also soon found out that we could help each other attack and kill the same zombie, but almost all non-quest items were spawned just for our own characters. This mean that we could attack the same zombie but both still loot something from its body, often different items thanks to the RNG. The same applies for any containers so we never had to worry about stealing each other’s items. I think this goes a long way to encouraging players to work together rather than against one another. Thoroughly impressed by this co-op system, we gathered up a few quests around The Tower (one of the main survivor hubs), and ventured out into the zombie-riddled city. We spent quite a few hours mostly jumping around and smashing heads in at first. I really like how they combined an open world with parkour/free running, in a style that reminds me a lot of Assassin’s Creed. Their city is our playground. 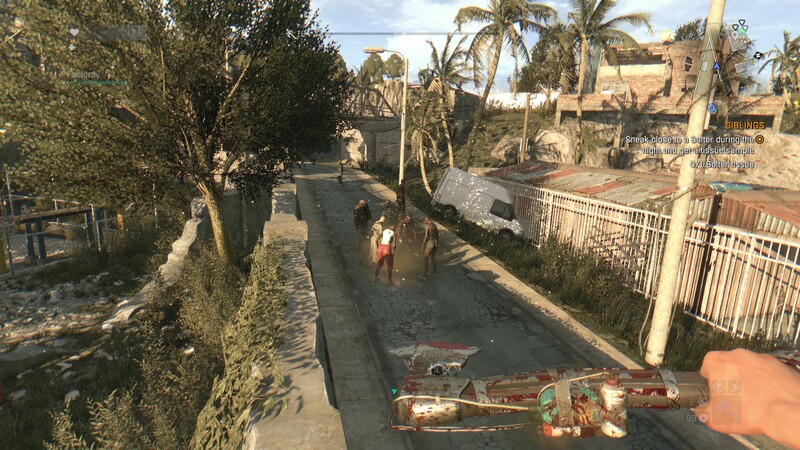 It was especially important at the beginning of the game when we weren’t particularly powerful or skilled at zombie-killing. When it takes 4-5 whacks from a weapon to make a single zombie go down, wadding into a huge group of them is just suicide. Luckily, the majority of zombies are both slow and terribly clumsy, so it’s pretty easy to run away or to climb up above their reach. And climb we did. We learned pretty quickly how to scale straight up walls using windows and ledges as hand holds, jump from roof to roof, leap over obstacles while running, slide under spike traps, and even shimmy up poles. It’s not completely realistic as you can see, especially the “leaping off 6-storey buildings and landing unharmed in a pile of trash” part. But it is so enjoyable, almost as much as zombie killing. Did I mention there’s grappling hooks and ziplines later on? Because there totally is. 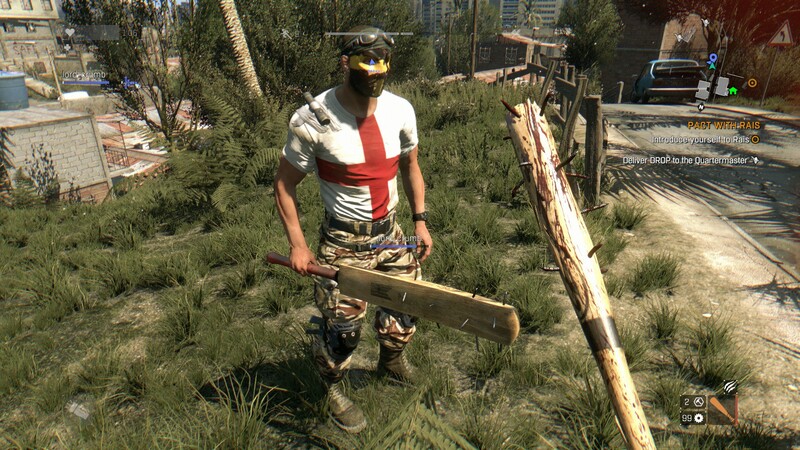 Speaking of killing zombies, there are so many weapons available in Dying Light. The wikia says there are over 110 different types and we’ve certainly come across most of them. Just off the top of my head, I’ve used baseball bats, cricket bats, hammers, police batons, knives, axes, cleavers, blades, crowbars, pipes, machetes, wrenches, swords, shovels, and a huge piece of rebar with some concrete on the end of it. He just needs some tea and biscuits to look even more English. 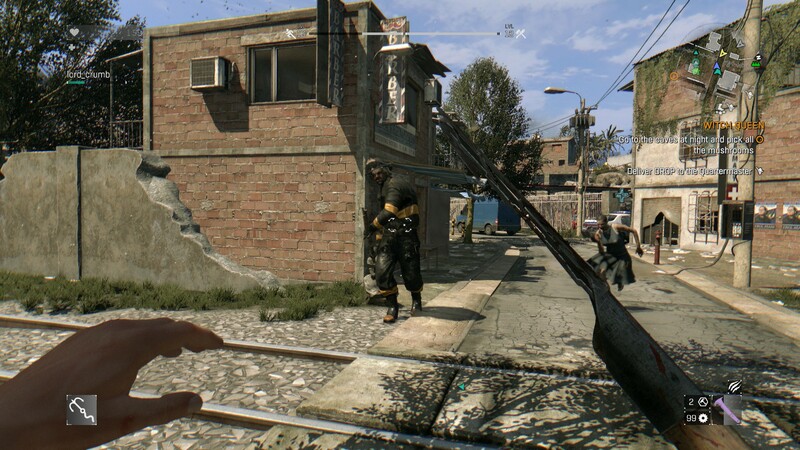 That’s just melee weapons. There’s also several different kinds of guns (including pistols, shotguns, and rifles) and a myriad of throwable items that have different effects. One of our favorites has been drawing zombies into a group with firecrackers and then setting them ablaze with Molotovs. 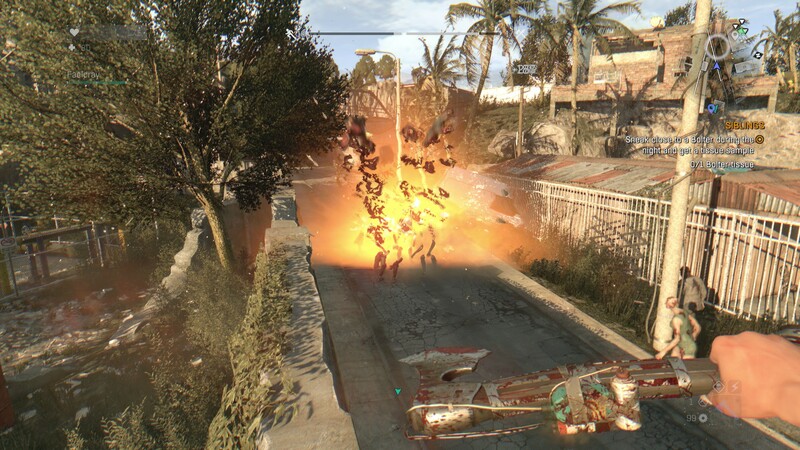 Although now we’re able to make explosive trap bombs which lure zombies in with a firecracker-like effect and then blow them to smithereens. Lord Crumb got some great screenshots of this as it happened. 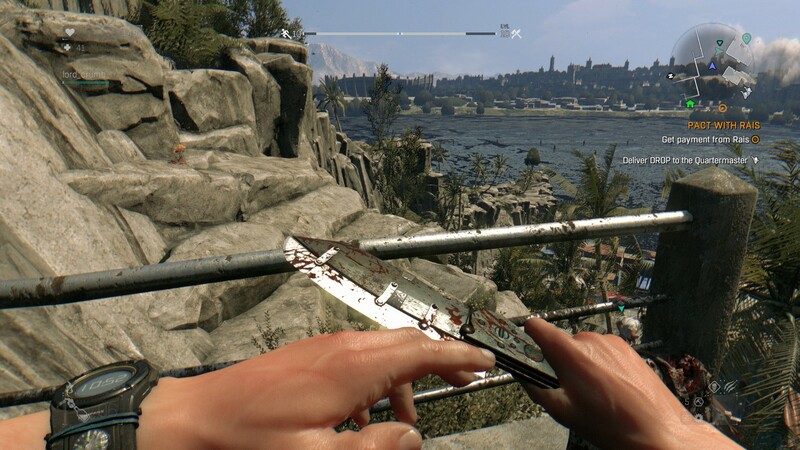 If you dislike blood and gore, Dying Light is probably not a good game for you. Because there’s a lot of it, as well as flying body parts. 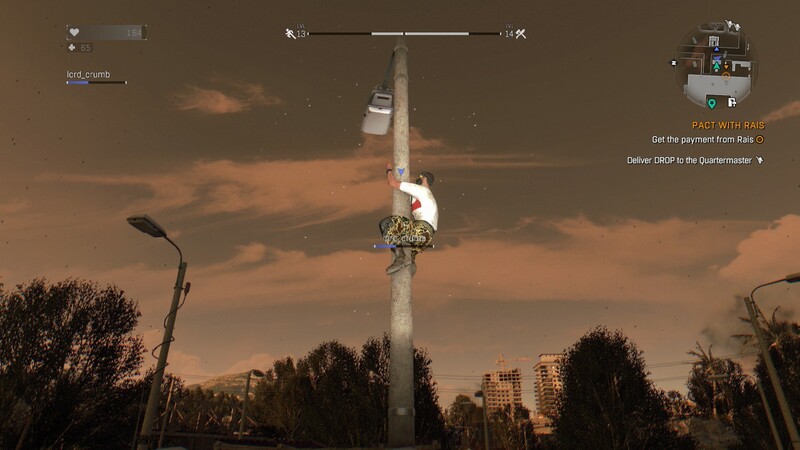 It’s also possible to use your character’s body as a weapon. 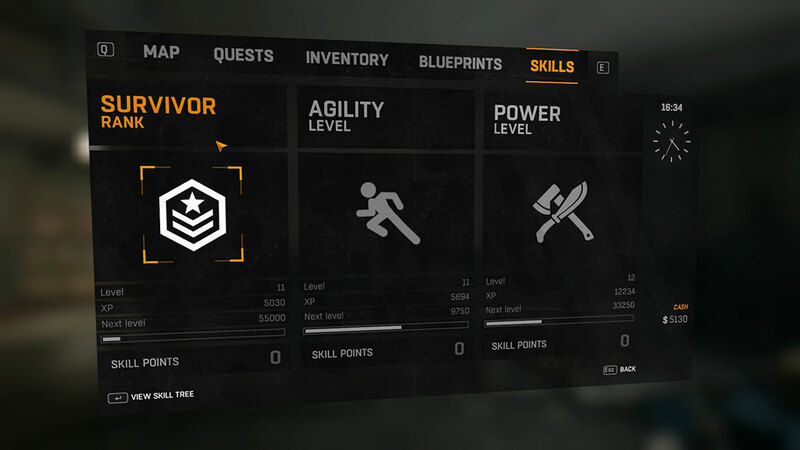 Through the skill trees, we were able to unlock abilities such as mid-air drop kicks, drop attacks from high up, breaking legs with slides, stunning enemies by jumping on their heads, and sneaking up behind them to snap their necks. We’ll eventually unlock all the skills but earlier in the game, it allowed us to tailor our playstyles to the way we liked them. It’s interesting how we differed in our approaches to combat. 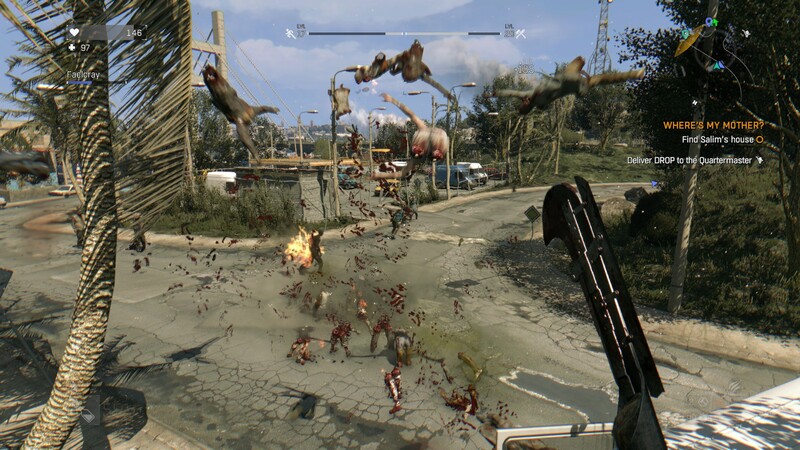 Lord Crumb likes to get right in there with a big melee weapon and use the drop kicks, slides and stealth attacks, while I prefer to play it slightly safer with melee weapons that have more range and jump on zombies’ heads to get through a pack. Although now that I have a fast bladed weapon that easily cuts off heads, I feel more confident about leaping into the fray. Another interesting mechanic is the the location of your hits matters. In this case, it seems I cut off its arm as well as its head. If I used a bat on its legs, they would turn bloody and likely break, forcing it to crawl around on the ground. 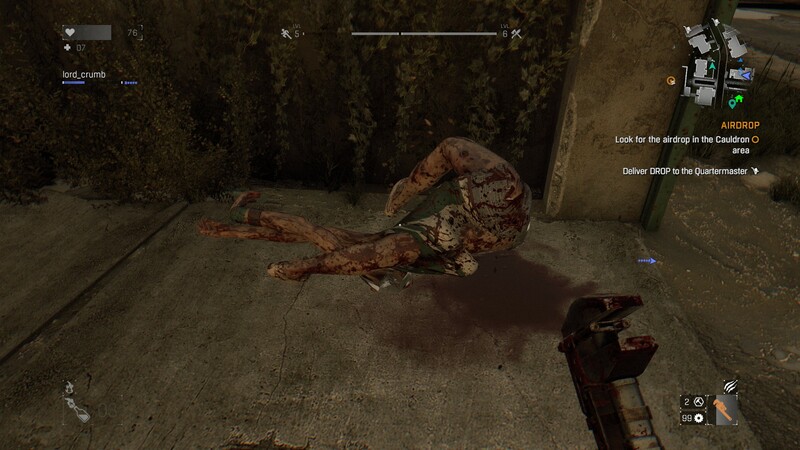 The torso might be the biggest target but hits to the head and neck generally cause more damage and kill the zombie faster. But sometimes I get a lucky hit to the torso with a blade, shearing it right in half. Yep, totally meant to do that. One cool skill that Lord Crumb likes is the ability to throw your melee weapon. Which is how this poor sod ended up with a cleaver in its head. Too bad there are no records to throw. I’m really enjoying the crafting in the game. Materials are plentiful if you take the time to stop and search, and everything is used in some sort of blueprint (recipe). Thankfully, the blueprints list the required materials so we didn’t have to guess what would make our items. We’ve crafted items such as med kits, firecrackers, Molotovs, throwing stars, and those delightful trap bombs. Probably the best part about crafting is that it can used to upgrade weapons. Depending on which effect you add to your weapon will change its appearance. A bleed effect will add extra blades or nails, electrical will add a battery which sparks shooting out occasionally, fire adds some little fuel tanks with nozzles, and so on. Mods can also be added to weapons to give them more damage, be more durable, or make them easier to handle. That’s right, I put another blade onto my blade. And just for a little bonus, weapons look visually damaged as it gets closer to needing a repair. 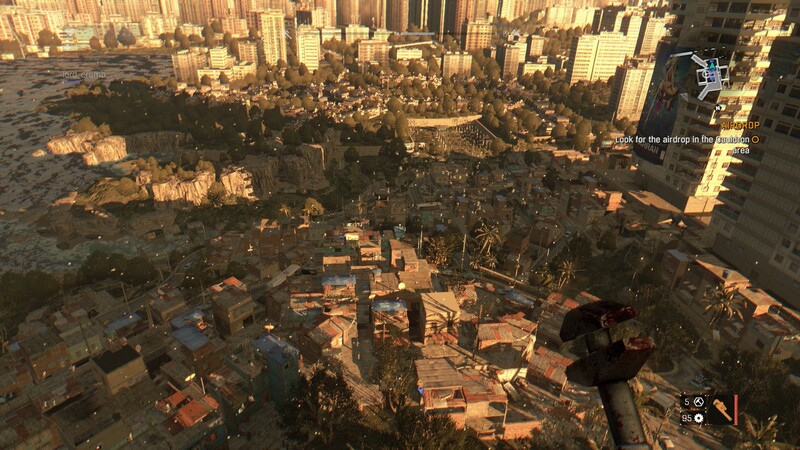 I know repair systems aren’t exactly exciting but I think Dying Light did a pretty good job with theirs. There’s a limit on the number of repairs you can make and lower quality weapons have a lower count on those, so when we first began playing, our inventory was always full of spare weapons. But this encouraged us to try a lot of different weapons at the start and we were then able to be choosier once we could loot/buy higher level weapons. Between weapons that I can repair 4 or 5 times and skills that make my weapon more durable or have the chance to not use up a repair count, I now have a favourite machete that’s been the only weapon in my inventory for a while. I like how they started us off with a lot of regular zombies at first and have been slowly introducing more dangerous ones as we’ve levelled up. The non-regular zombies have their own names but apparently we missed that memo and have been calling them whatever pops into our head, usually references from Left 4 Dead. Among the plentiful slow and clumsy regular zombies are some that carry weapons and have been known to throw them at our heads. Then there are some shuffling around in hazmat suits that can’t bite, but they have gas tanks on their backs that can be damaged and explode. Noises like that attracts what we call runners, zombies that look normal but are capable of running and climbing. You’re certainly not safe from these even if you climb up high. To avoid them, the best thing to do is to just run away from the source of the noise. Higher up on the danger scale are what I creatively call “big dudes”, huge zombies that walk around dragging a rebar-and-concrete weapon that’s usable if he’s killed. Zombies of this variety have knocked us to the ground many a times before we learned to jump back once he starts to take a swing. 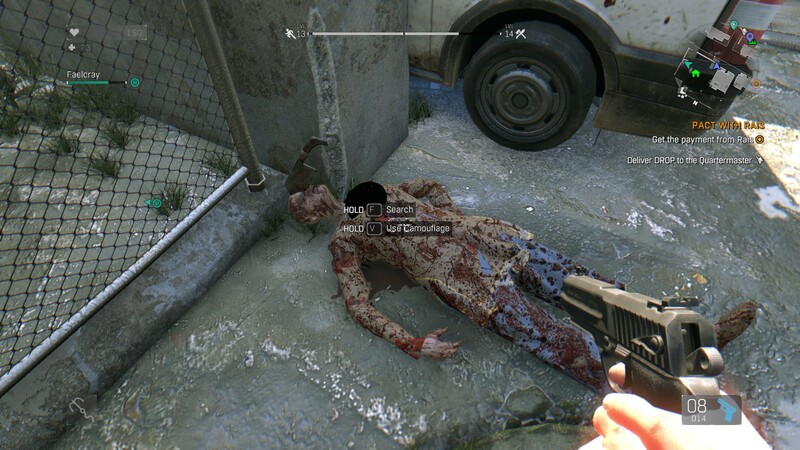 Then there are zombies who spit acidic puke at you from a distance, which we of course called spitters. 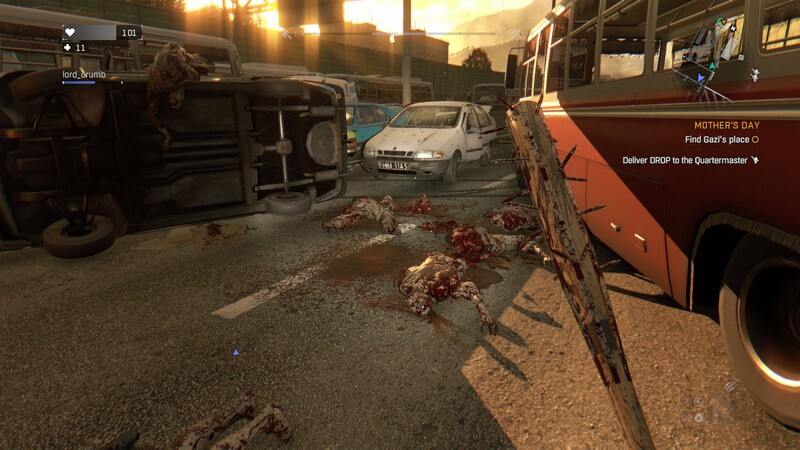 Exploding zombies that we call boomers can be worse than their Left 4 Dead counterparts, because if you’re next to him when he explodes, you’re dead. 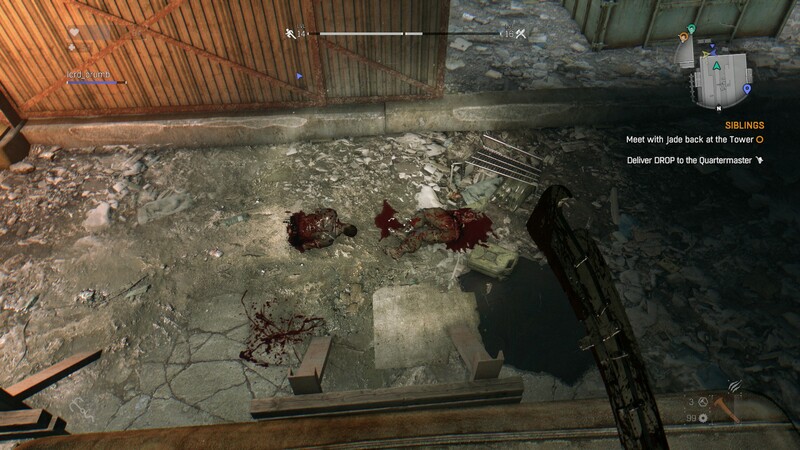 We try to pick those off from a distance if we can and around other zombies, because they do hurt their own kind when they explode. A fireman “big dude” with a runner on the right. The most terrifying zombies are the Volatiles, which thankfully only come out at night. They are scary, fast, and will take chunks out of your health in just a few swings. Our first encounter with them involved Lord Crumb dying and me racing through dark streets saying “ohgodohgodohgodohgod” as I desperately searched for a safe house. It wasn’t until we had gained quite a few levels and bought some better weapons before we were able to take some down without dying. Even then, we like to stay close to a safe house while we do it so we can retreat if we need to heal or repair. Running around at night still is, and likely will continue to be, quite an adrenaline rush. Did I mention that they like to pounce out at you from the darkness? Speaking of levels, the game has a skill based levelling system which has always been one of my favourite kinds. Survivor is raised through completing quests and random events, agility through parkour, and power through fighting zombies. So no matter what activity we’re doing in game, even if it’s just running around, we’re always improving our skills. Another handy addition to encourage co-operation is the fact that Lord Crumb and I get survivor points for healing one another, and that if we’re close together, we get agility/power points for each other’s kills. Last but not least are the quests. There’s one main story quest line, a number of optional side quests, and events that pop up on the minimap such as air drops, saving friendly survivors, or killing rival survivors. We have yet to have a moment where we had absolutely nothing to do, in fact there’s often too many things to do at once. The quests range from somber to amusing and we’ve met quite a few interesting characters. Including a gasman who fancied himself a general. 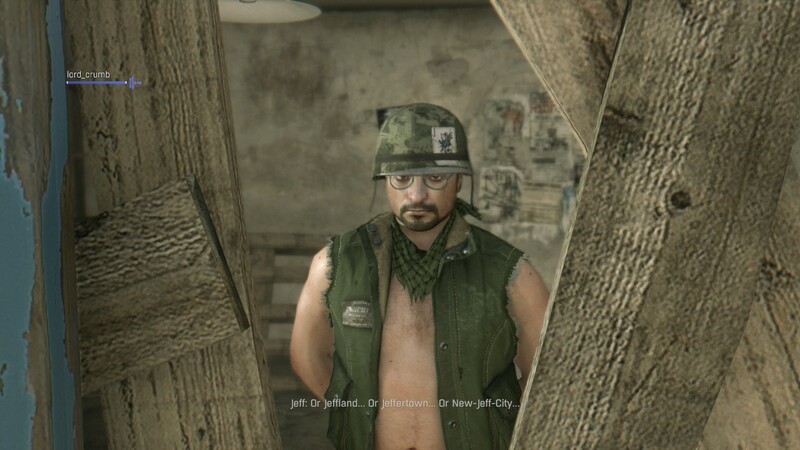 Can’t you…button up your shirt or something, General? So far the quests have been quite good even if a few are a little depressing. It is the zombie apocalypse after all so that comes with the territory. We’ve been completing all of the ones we’ve come across and even though our skills are around 20, we’ve only completed about a quarter of the main quest line. So I’m certain that we’ll reach all of our level caps well before we’re done with the game. 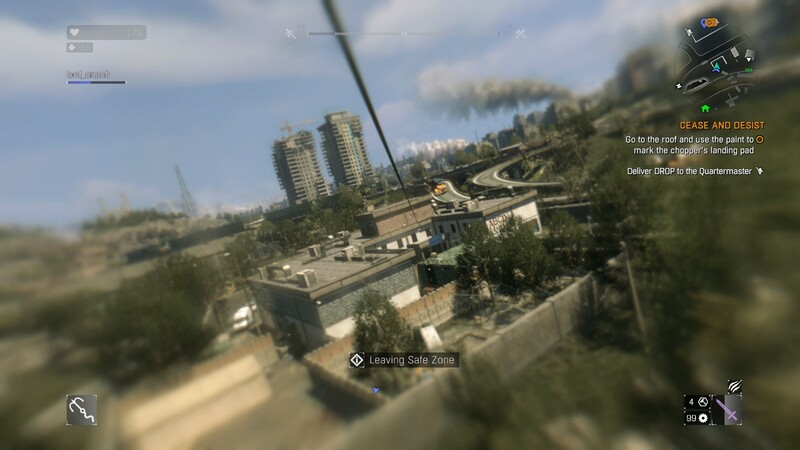 Anyways, the whole point of this post is that Dying Light is a super fun game that’s even better played with a friend. If you like the idea of a open world parkour zombie apocalypse, I’d highly recommend buying this. 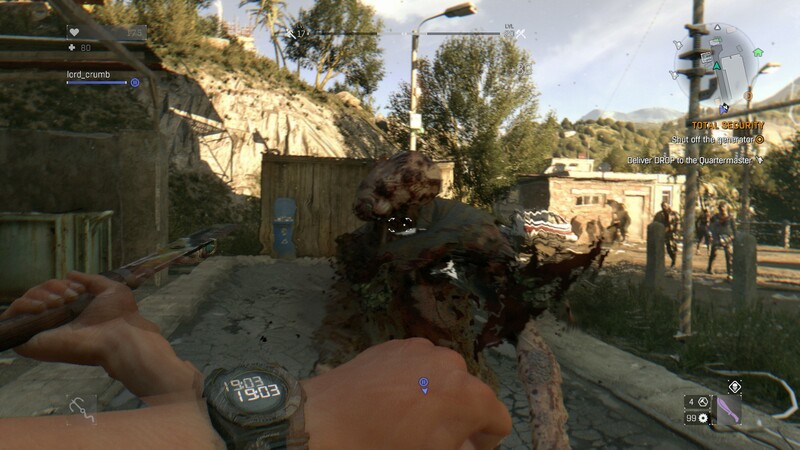 And as a bonus, you can be entertained by amusing graphical/physics glitches such as the Amazing Contortionist Zombie! I don’t even know how that would work. Zombies, brrr! You won’t find me playing a zombie game any time soon. But but…killing zombies is fun! I’m not one of zombies, but this review makes me interested in the rest of the mechanics. Thanks Faeldray. You’re welcome. 🙂 I have to say that even if zombies weren’t included, I’d enjoy this sort of game anyways. If I find any more like it, I’ll have to make a post out of it! That would be awesome if you did. It sounds real fun.